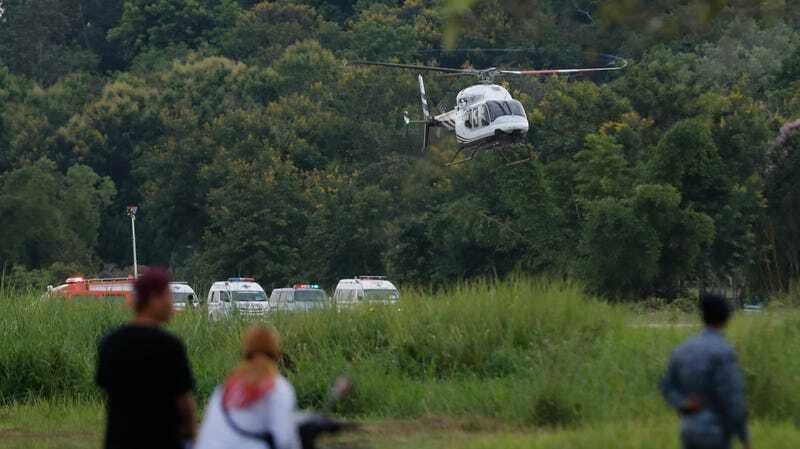 A helicopter carries one of the rescued boys to a hospital in Chiang Rai. An 18-day ordeal in which the Wild Boars soccer team was trapped inside a flooded cave complex in northern Thailand has finally come to an end, with the twelfth team member and the coach exiting the cave earlier today. Jedsada Chokdumrongsuk (center) permanent secretary at the Public Health Ministry, speaks during a press conference at a hospital in Chiang Rai province earlier today. The quarantine will end in about seven days, but until then, family members can interact with the boys through a glass window and talk to them on the phone. The boys are said to be upbeat, but the initial euphoria of being rescued may be fleeting. The long-term psychological effects of this ordeal on the boys and the coach won’t be known for some time, with post-traumatic stress disorder being a distinct possibility. The Wild Boars were missing for nine days before being discovered by expert divers on July 2. This search-and-rescue operation would not have been possible without the hundreds of personnel and volunteers who came to help. It was a truly international effort, involving experts from the UK, US, Australia, China, Myanmar, Laos, Japan, and many other countries. But as the operation comes to a close, many thoughts are of Saman Gunan, who died while trying to help. In respect of his sacrifice, the Thai ex-Navy diver will be honored with a state funeral.